Galvanised and powdercoated metal trellis panels - Arrange multiple panels in your own unique design! Price is per panel as per 2nd picture. First picture contains 3 panels. 2no. fixing holes per panel, fixings and wall spacers included. 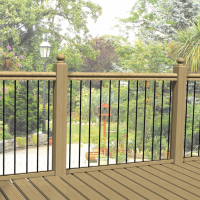 DioMet are pleased to offer a 15% discount on our metal railing panels - used for decking and garden..